A 24 year old woman who presented at INER (Instituto Nacional de Enfermedades Respiratorias) at Mexico City complaining of shortness of breath, weight loss, and chronic cough. 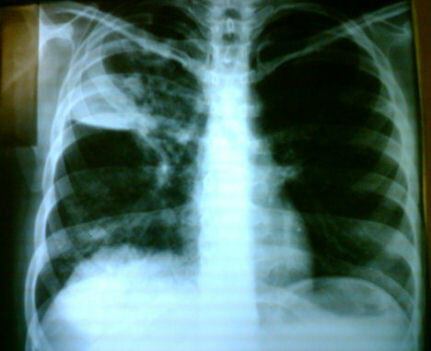 This image shows a classic radiographic appearance of pulmonary tuberculosis. An heterogeneous image with alveolar filling pattern and homogeneous opacity are observed at the right apex. Elevation of right hemidiaphragm due to atelectasia is also shown. You can also look at this pic, Or this other.